For the first time, a computer simulation shows how solar material burst from the sun’s surface form, helping astronomers understand how these spicules can break free of the sun’s surface and surge upward so quickly. At any given moment, as many as 10 million wild jets of solar material burst from the sun’s surface. They erupt as fast as 60 miles per second, and can reach lengths of 6,000 miles before collapsing. These are spicules, and despite their grass-like abundance, scientists didn’t understand how they form. The new work relied upon high-cadence observations from NASA’s Interface Region Imaging Spectrograph, or IRIS, and the Swedish 1-meter Solar Telescope in La Palma, in the Canary Islands. Together, the spacecraft and telescope peer into the lower layers of the sun’s atmosphere, known as the interface region, where spicules form. The results of this NASA-funded study were published in Science on June 22, 2017 — a special time of the year for the IRIS mission, which celebrates its fourth anniversary in space on June 26. 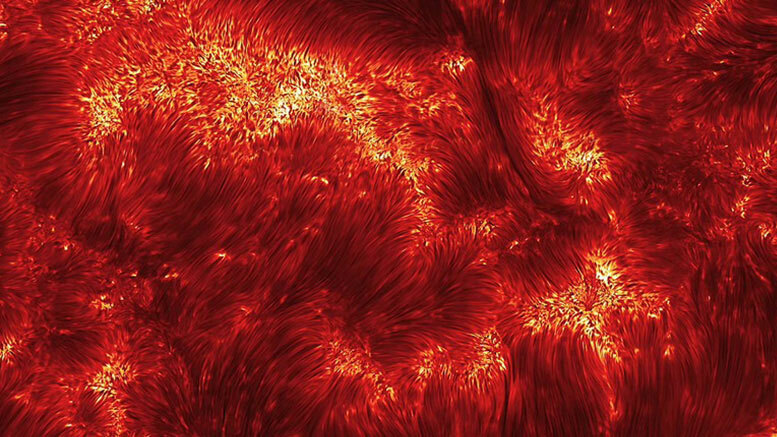 Be the first to comment on "Astronomers Uncover Origins of the Sun’s Swirling Spicules"